Abandoned!! I felt utterly abandoned, stranded in front of the neighborhood ice cream stand, reading the ‘closed for the season’ sign. It was after Labor Day, the official end of summer, and 25,000 copies of the Farmer’s Almanac had just been handed out at the York toll booths inviting people to come back again to “Maine, the way life should be.” The summer people arrive in droves, significantly swelling the local population for one season each year. Indeed, my own childhood had meant weeks spent at York Beach on the south coast. On the August day that Wheaton Van Lines unloaded my stuff into the second floor apartment above a garage, the weather was 95 degrees and equally humid. But if the days were brutally hot, the nights cooled down enough, if not for sleeping, then at least for walking to the main street for ice cream at the corner. But now the summer people had left, like rats deserting a sinking ship, and it was closed. And I wasn’t leaving for the winter. I had committed to an interim ministry year in Yarmouth, seduced by the charm of the earnest search committee members who’d come to the church to interview me at 7:30 AM, before going to work. And then there was the church itself: an archetypal white meeting house with a steeple that could be seen throughout the small town, until it was taken down for repairs that fall. 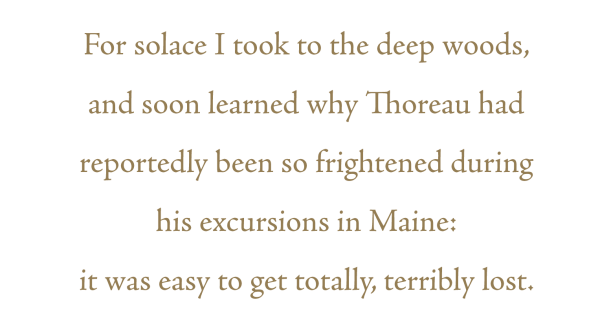 For solace I took to the deep woods, and soon learned why Thoreau had reportedly been so frightened during his excursions in Maine: it was easy to get totally, terribly lost. Even what should have been a quick hike off the country road along a trail created for that very purpose became a misadventure when the sun was covered by clouds. After two episodes of breaking out of the brush and being unable to find my car, then hitchhiking miles to where I had left it, my brother made me buy a compass to carry with me. It never made it out of the glove compartment so wasn’t ever helpful. I didn’t venture forth comfortably until after the first snows, when I could follow my own footprints back to my car. At roadside farm stands, there was a basket set out to receive money for the produce. Of course you’d pay what was asked. Even at the dairy farm, the store was often unattended, with the prices clear on the milk and eggs, etc, and a container set on the counter for the money. It was a code of ethics among people who trusted one another and in a way of life others wanted to share. And the community worked hard to keep it that way. In fact, two local youths had persuaded the Town Council to pass a Cool Cities initiative, requiring drivers to shut off their engines in front of schools and while waiting for lights at intersections….to limit emissions and keep the air cleaner!